Good evening all. Sorry I haven’t posted for almost a week.. I’ve been so busy/tired! 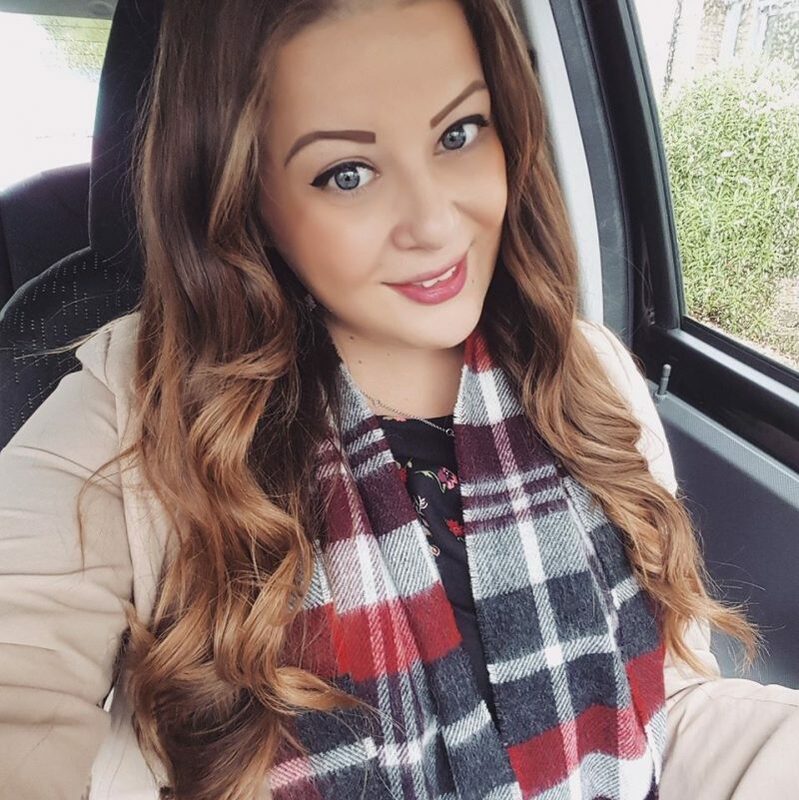 I don’t think I’ve ever left such a big gap between posts before.. eek! Anyway I have something really awesome to show you! 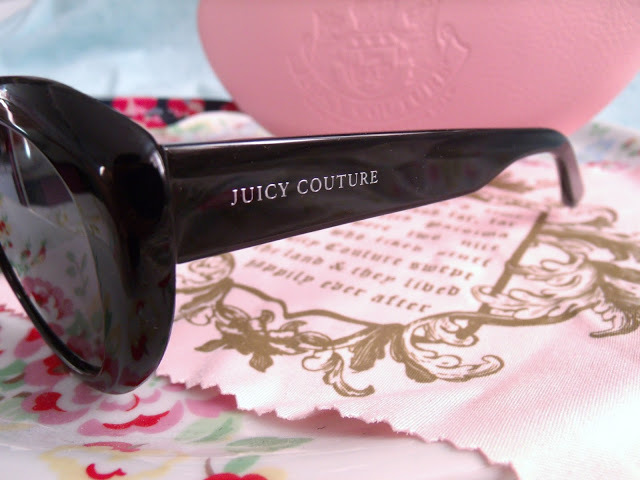 SmartBuyGlasses recently asked me if I wanted to review a pair of their designer sunglasses, and I jumped at the chance! I’m going on holiday in a few weeks and needed some new sunnies, and what’s better is that they also do prescription shades! 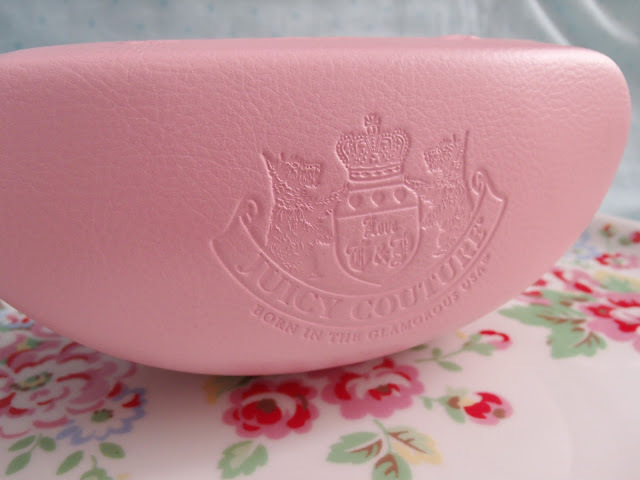 I’ve always been a (secret) fan of Juicy Couture. I’m not sure why exactly.. as most people think the brand is chavtastic.. but it really appeals to me for some reason. Anyway I browsed through their massive selection of sunglasses and settled on this pair called ‘Enduring‘ (RRP £129 but sold for £96.95). They sell lots of other designers too, such as Tom Ford and Christian Dior. I picked this pair because I like the big retro glasses shape, and also I liked these ones because they have a little cat eye flick in the top corners. But what I found most attractive was the inside of the arms; they have a really bright, bold print! I’m a sucker for any kind of colourful pattern! 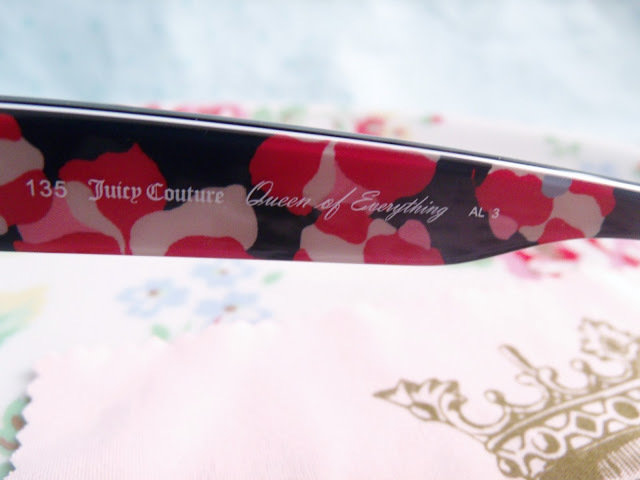 Also on the inside it has printed ‘Queen of Everything’ and has a little silver Juicy Heart on the end of one of the arms. The outer frames themselves, and the lenses, are black. I was really excited when they arrived (the weather had just started to pick up!) 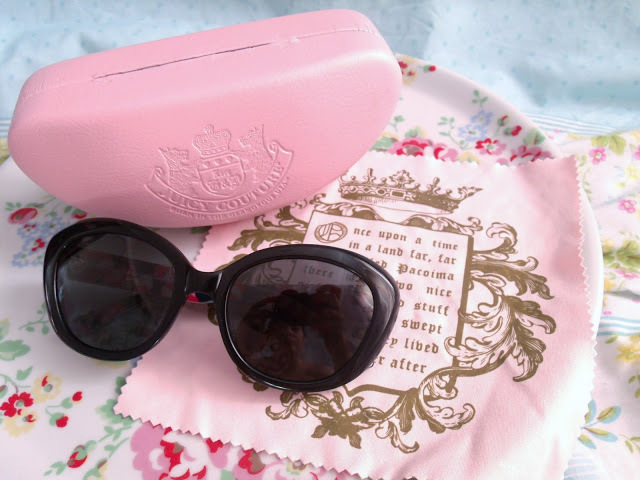 and I was really impressed with the quality of the glasses and the accessories. The glasses were shipped from Hong Kong (but seem to be genuine from what I can tell!) 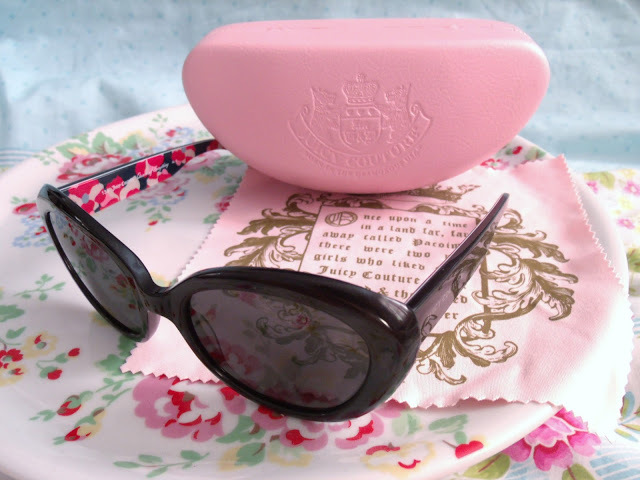 and they came with a pink Juicy Couture embossed glasses case, and a matching cleaning cloth. They also threw in a bottle of lens cleaning liquid and a screwdriver. I chose prescription glasses so I was a little bit wary that this could go a little bit wrong, but they are as clear as my UK glasses! In fact, they are perfect and I cannot fault them at all. I have been wearing them whilst driving and have had no issues with them at all, and I cannot wait to take them on holiday (I hope I don’t sit on them). 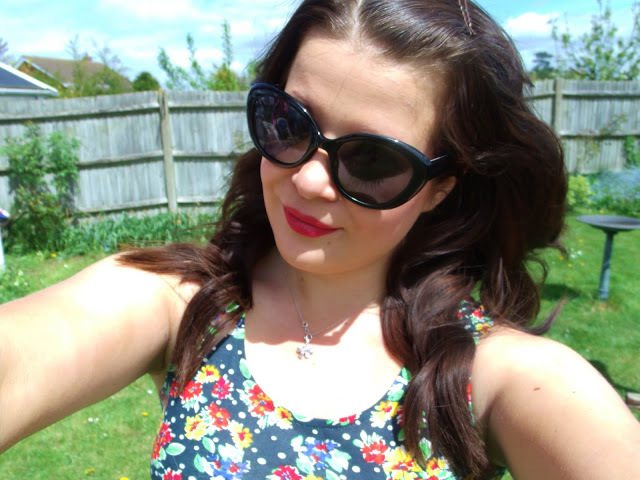 See below to enter my new giveaway to win your own pair of £100 designer sunglasses from SmartBuyGlasses! 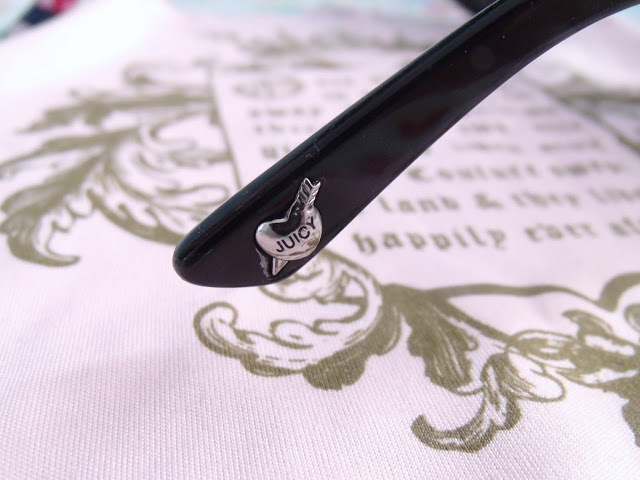 The glasses are lovely, really love the shape!